Seriously the perfect Brown Butter Granola with Pecans and Cranberries. If you aren’t familiar with Brown Butter, then check out our recipe and tips on the many ways you can utilize this amazing flavor enhancing technique here. We also toss some Pan Roasted Pecans into this mix, and wow it’s a one-two punch of flavor! Eaten plain, in a bowl with milk, or adorning our Easy Peach Parfait it’s a supercharged food. What type of oats do you use for granola? Old-fashioned Oats: Are our main oat choice for this granola, their perfect chewy consistency is the base of most granola recipes. Sometimes called rolled oats, they have a flat oval shape which is achieved when the kernels are steamed and then rolled to flatten them. Steel Cut Oats: We’ve added steel cut oats for their excellent texture. Also called Irish or Scotch oats they have been cut and not rolled. And have the appearance of fine grain and a chewy texture. What type of nuts are best in homemade granola recipes? Whatever your heart desires! Here we add our Pan Roasted Pecans because they add an extra depth of flavor, that compliments the brown butter. If you don’t have pecans, you can use what you have on hand, but I do suggest that you toast them up in a pan before blending into the granola. The same goes for dried fruits, here the cranberries are a great pair with the toasted pecans. But you can use what you have on hand too! Why use Egg Whites in Granola? 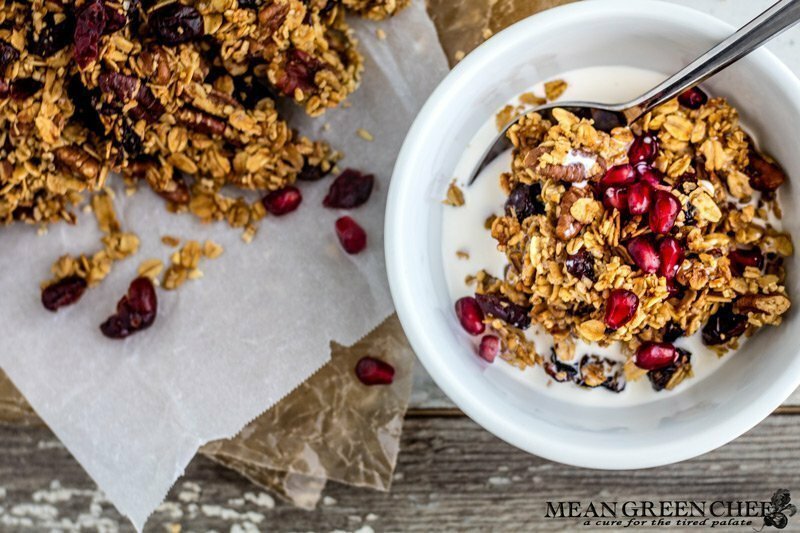 The Key Ingredient that binds the ingredients together and creates tremendous granola clusters! We always make double or triple batches of this granola and still disappears faster than we can make it. The recipe here is for a double batch, you can easily halve it to make a single but goes quickly, you’ll catch yourself snacking on it soon after it comes out of the oven! Seriously the perfect Brown Butter Granola, perfect for eating plain, in a bowl with milk, or in a yogurt parfait! Preheat the oven to 300°F/150°C, arrange rack so that it's the second level from the top and line a baking sheet with parchment paper. Mix the old fashioned oats, steel cut oats, pan roasted pecans, dried cranberries, dark brown sugar, cinnamon, and sea salt together in a large bowl. Pour in the Brown Butter, honey, pure vanilla extract, and frothy whipped egg whites. Stir until thoroughly combined and ingredients begin to stick together. Spread out on the parchment lined baking sheet and press down with a flat wooden spatula until the mixture is even and becomes compacted. Bake for 30 minutes and then rotate the pan and bake for an additional 15-30 minutes until the granola becomes golden toasted and crispy. Remove from the oven and cool completely and then break into chunks. Store in an airtight container at room temp up to 2 weeks. Looking for other great snack ideas? Then check out our other recipes! Angela, I love this recipe! I eat a lot of granola and sometimes it is hard to find a good recipe to make at home! Thank you can’t wait to try this! This looks really good! Brown butter is new to me. I had never heard of that before! Thanks! Oh my gosh. Yum! I love granola. I like putting it with some yogurt and a drizzle of honey. And sometimes blueberries or something on top! Can you offer a vegan version of the same granola bar? I would love to try it! Looks delicious !!! I love, love, love brown butter! This recipe would be a great transition to get kids off of commercial cereal! Hey Tricia! 🙂 It really is a magical component to upping the flavor ante in so many dishes! I know your kids will love it too 💚 thanks so much! This looks amazing!!! I’ve tried making granola before and it never turns out right. Thank you for all the little tips. I love granola and butter so what’s not to love here! Thanks for sharing and the tip on egg whites was super helpful. Um, I’m making this! I pinned it to my recipes so I can try it. Can’t wait! You also have great photos. Very professional. Homemade granola is by far the best, and your recipe looks wonderful! Your photos are absolutely lovely! This looks and sounds amazing! I can’t wait to try the recipe! This looks super yummy. I love making granola, can’t wait to give yours a try! Your photos are beautiful! This looks so tasty! I managed to find certified gluten-free oats so I will have to try this recipe out! I love brown butter! I love granola! This is the best of both worlds! Sounds delicious…thank you for sharing! Yum! I love granola and I love pecans, so this looks delightful! Also, I’d never really thought about what steel cut meant. Thanks for the info! You had me at pecans and cranberries. Looks absolutely delicious! Never would have thought that you’d use egg whites in a granola recipe. Thanks for sharing, it looks delicious! This looks so delicious! I would love to have this to put on my overnight oats in the morning and give them a nice texture and punch of flavor! YUM! Looks wonderful! I’m vegan so I’ll have to play with the recipe and see what I can come up with. Thanks for the inspiration! This may not be what I was supposed to take away from this, but I just had a lesson from Google about beurre noisette because I did not know what is brown butter. Learning new things can be a treat, so thank you for exposing me to a new-to-me food item! This! This is the recipe I’ve been looking for! Can’t wait to try it! Thanks for sharing! I was just talking about looking for a recipe to make my own granola the other day. Now I do not have to search. this looks and sounds wonderful. Thanks!! Ooo, great idea on the eggwhites. I’ve experimented with other things, but this makes sense! Healthy and delicious! Love the way you offer up some many choices. This is a must try! Thanks Angela! There is something about pecans and cranberries that goes so well together! This looks delicious! This looks delicious! I’ve been trying to watch what I eat after having a baby and this sounds like the perfect “treat” for me 🙂 Thanks for sharing! This looks like a flavorful breakfast!!! I love the brown butter!! This recipe looks so delicious! I love granola!